From the time that the John Dickinson mill opened in 1830 and began offering job prospects as well as encouraging workers to settle in Croxley Green, other business opportunities developed in the area. These companies also began to prosper and offer a variety of skilled jobs for residents. It was because of this, that a growing and successful independent community was set in motion. It was some time however before drastic changes were to occur in the village. 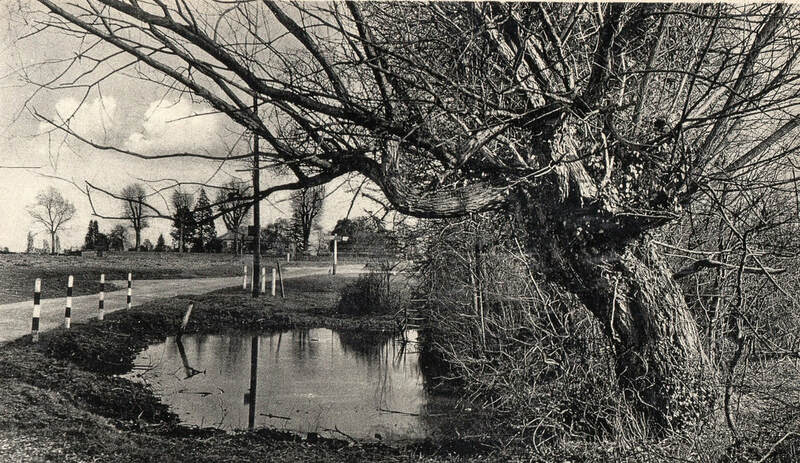 The early development of Croxley Green just over 150 years ago did not initially make any great impact on the neighbourhood as it was still considered then a farming area, producing crops and animal produce. Situated in the south west of Hertfordshire, Croxley Green has been documented for its wealth of orchards growing many varieties of fruit. The Green was surrounded by small individual orchards producing fruit for personal family use within the village. Many of these were attached to smallholdings. The planting of fruit trees either on a large scale or just for the family was a means of providing extra food for the housewife who would make jams and preserves and also store selected keeping varieties. Many residents remembered Mr. and Mrs. Overton's cottage with an orchard site where the library is now situated. Prior to the development of Barton Way, Fuller Way and beyond, this area led to acres of fields with a farm gate leading to them from New Road. Many remember the very large walnut tree in particular as well as the opportunity to buy the fruits. Dairy cattle were kept by many farmers, any additional milk being delivered to the homes in churns transported by horse and cart. New Road had many small dairies that would sell on the milk. Otherwise local residents might visit the establishments and collect the milk in a jug. This could occur up to three times a day as there was no refrigeration. © The corner of The Green - Loudwater Lane. This small pond was one of the five dew ponds that could be found around The Green. Bunding in this area and the differing weather patterns has made these dew ponds inactive. Many past residents have re-called ducks would often be seen to make this pond a visiting venue! Between the First and Second World Wars the demand for quality milk increased and it was tested for bacteria and impurities on a regular basis. Once collected, the milk was transferred to churns and usually left at the farm entrance for collection from where it was taken to a central plant and thence delivered in glass milk bottles to homes by 'the milkman'. At this time agriculture was still one of the main forms of employment in rural areas including Croxley Green. During peak times farmers with land under the plough might require extra casual workers from nearby towns as well as members of the farm labourers' families, including children. Eventually, with increasing mechanisation and the land being taken for new homes, the farm labour force began to decline and villagers had to seek alternative employment. As a result of the construction of the Metropolitan Railway extension in the 1920's from Moor Park to Watford Park via Croxley Green’s ‘green and pleasant land’ , housing developers were attracted to this area and land owners were keen to sell. Between 1930 and the onset of World War Two in1939 a vast ‘ribbon development’ of new homes was built encompassing New Road and Scots Hill, the then main residential areas. At this point in time many farmers switched quite suddenly from horse-power and mass labour to tractor power. So for Croxley Green hundreds of acres of fields disappeared rapidly in less than ten years. Fowl Robbery – On Friday Night last or early on the following morning, fourteen fowls were stolen from the hen house at the farm of Mr. J. Asutis, Croxley Green, Rickmansworth. A reward of £5 has been offered for the apprehension of the perpetrator.